Remember how last week on The Vampire Diaries, I predicted that a Steroline reunion was on its way? Well, they reunited for sure. It just wasn’t a happy affair. Not even a little bit. Not only did Caroline (Candice Accola) totally give Stefan (Paul Wesley) the brushoff when he showed up at her door, but she made a point of kissing Alaric in front of him. Of course, not even Stefan was convinced, finding the perfect moment to point out that Caroline and Alaric sleep in separate bedrooms. Definitely not the sound of true love. Which made me think: Have these two even done the dirty? Or is their relationship purely for show, for the sake of their kids? I’m guessing the latter. So with that in mind, I definitely think Stefan and Caroline will find their way back to one another romantically. The reason she’s so mad at him is that she clearly has some big, unresolved feelings going on — feelings that I cannot wait to see fleshed out. Hopefully that happens in the remainder of this season. The downside to all this Steroline tension is that poor Alaric is probably going to be left in the dust. Again. And while I don’t think Caroline will ever ditch her daughters, there’s a good chance she will be ditching Alaric. Will Alaric even show up in Season 8? I mean, I love seeing him on the show. 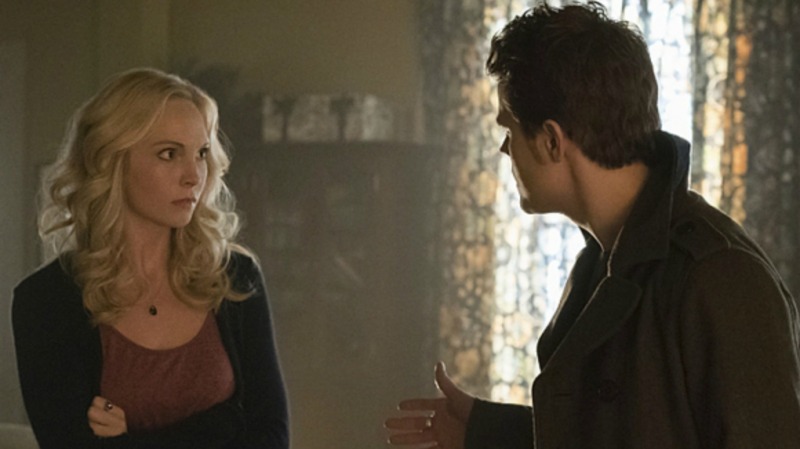 But he and Damon are on the outs, and he and Caroline are faking their way through an engagement, so it seems like maybe his time on the show is coming to an end. What’s the point if he doesn’t have any connections left with anyone? Meanwhile, I’m feeling super conflicted about this Steroline thing. They’re obviously far from over for good. But does that mean I want them to be endgame? This is the point when images of Klaroline begin circling in my brain. Caroline is clearly settling with Klaus. But is she also settling with Stefan? If Stefan and Caroline find their way back to one another again, then that’s it. She can’t totally rip his heart to shreds again. Stefan has been through the wringer almost as many times as Alaric. Do you think the show will end with happily-ever-afters or heartbreak in Season 7?